After some not insignificant effort, Gav has managed to secure us the use of the littlest of Clevedon beach’s ‘Caves’ – neatly arched and rendered lockable affairs set into the sea wall. It means our stuff has somewhere to be stashed, we can get dry even if it’s peeing down, and most of all, we have somewhere to eat cake. The cave-warming party was duly held on Saturday and a lot of cake was involved. The cave is now warm; outside however, the sea is still a little nippy. 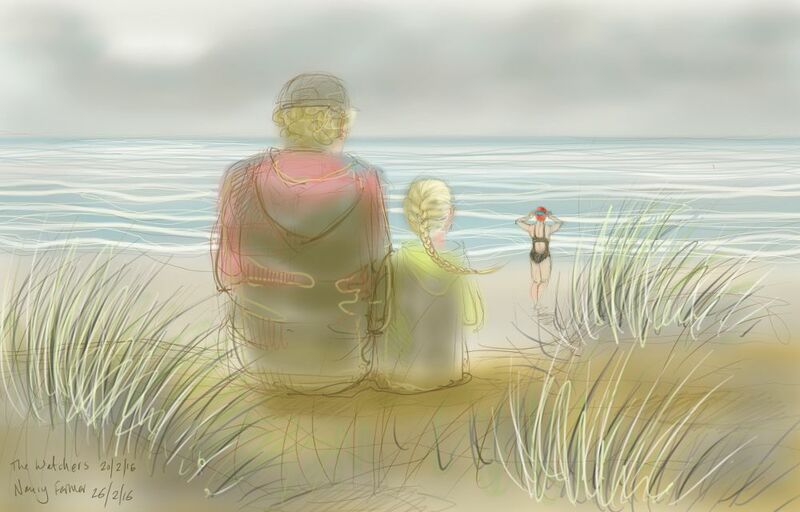 This entry was posted in showcase, swimming and tagged art, Clevedon, Clevedon beach, digital art, drawing, outdoor swimming, swimming, winter swimming on March 10, 2017 by Nancy Farmer. 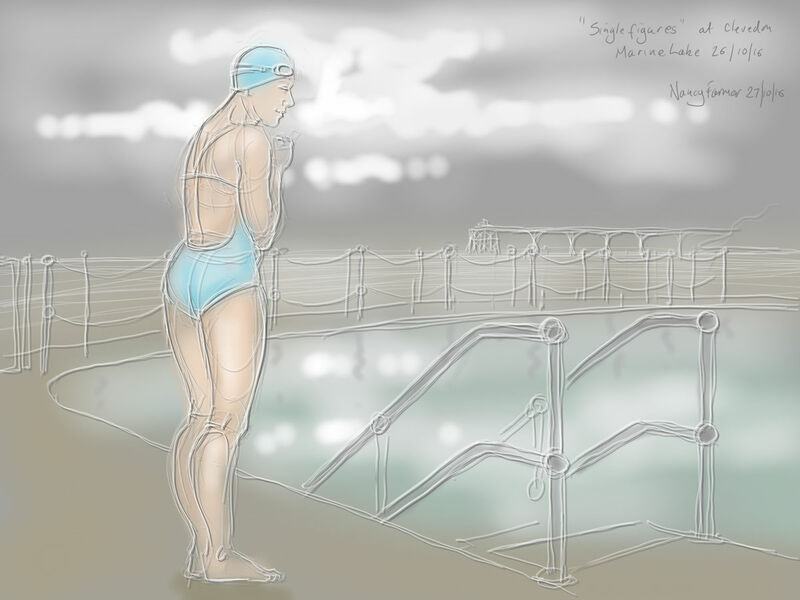 This entry was posted in swimming and tagged Clevedon, Clevedon Marine Lake, cold water swimming, digital sketch, drawing, illustration, North Somerset, swimming, swimming drawings, winter swimming on October 29, 2016 by Nancy Farmer. A man in a white van stopped, once were were in and acclimatized, and gazed in wonderment; announced, full of male bravado, that he’d join us in 5 minutes… and then drove away very quickly and never returned. 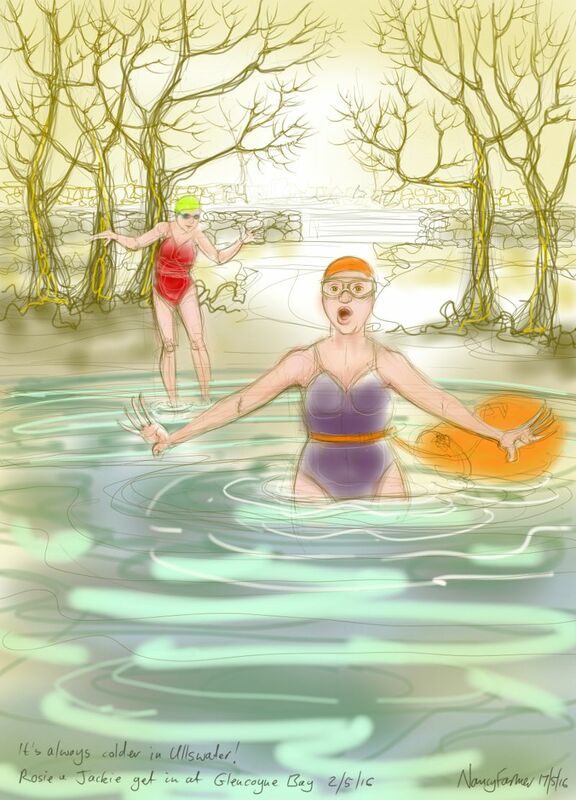 This entry was posted in swimming and tagged art, cold water swimming, Cumbria, drawing, illustration, open water swimming, swimmig, The Lake District, Ullswater, winter swimming on May 19, 2016 by Nancy Farmer. Last weekend I went to Norfolk. We drove to the beach, my brother, Georgia and I, and it was a pleasant 20 minute walk along a sandy causeway to get to the sea. So the sea did not need to be swum in for it to have been a nice outing, but it was there, and it did give the exercise a certain air of having achieved a goal. I was of course designated swimmer, and they the designated watchers. A 10 minute dip at a little under 7 degrees seemed sufficient to prove the point that the sea had indeed been swum in. The watchers, watching the sight of a lone swimmer in the sea in February, idly wondered if they could actually be of help if I were to need assistance, and came to the conclusion that a rescue party could probably walk to me. This was true, I could touch the bottom with my hands while still swimming, and further out it was clearly getting shallower for some distance. This is a reassuring circumstance for a winter swim: there it so very much huge flat sea around Norfolk and it’s so big, especially for one used to the Bristol Channel, a short shingle beach and the handy landmark of an unmissable Victorian pier. 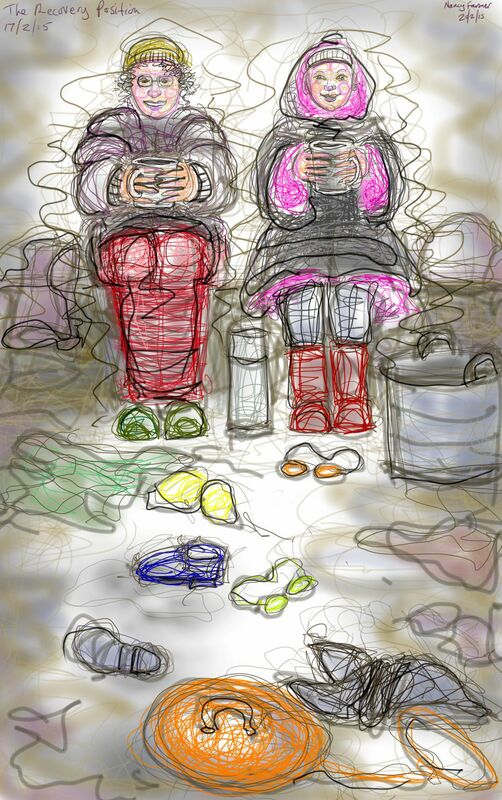 This entry was posted in People, swimming and tagged art, beach, cold water swimming, drawing, Norfolk, sea swimming, sketch, winter swimming on February 26, 2016 by Nancy Farmer. This weekend was the wonderful, fantastic event The Big Chill Swim, a winter swimming gala in Windermere, Cumbria, run by Colin Hill and the Chillswim team, to whom massive thanks for doing such a superb job! Fellow winter swimmers will no doubt recognize the sight of heavy fleece-lined waterproofs, woolly hats and extremely scanty clothing (often on the same person), as perfectly normal. ‘Not too cold actually, well above 6 degrees’ when assessing the water temperature, would likewise be an attitude only unsurprising amongst winter swimmers. There were so many images I could have drawn but these two chaps, deep in conversation in their anoraks and budgie-smugglers, were too good to resist! I don’t know who they are, but they know I photographed them so if anyone recognizes them please let me know, I did say I might draw them. 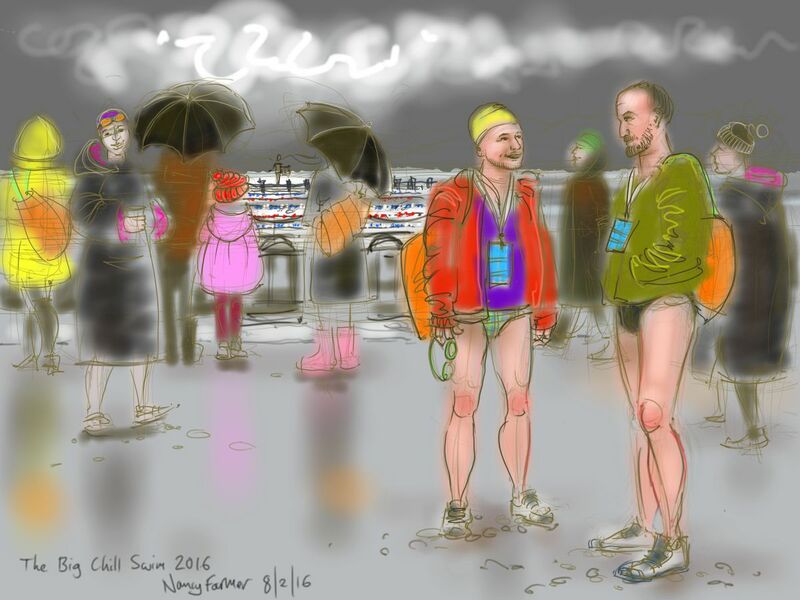 This entry was posted in Events, swimming and tagged art, Big Chill Swim 2016, Chillswim, drawing, illustration, Nancy Farmer, swimming, winter swimming on February 8, 2016 by Nancy Farmer.